In conjunction with Detroit’s Movement Electronic Music Festival, Give a Beat and Notes for Notes®launches Music for Music – an online fundraising campaign featuring an online auction and a SubPac sponsored story sharing contest. Music for Music showcases the transformative power of music and taps into the love and energy booming within the dance music community to raise funds for the construction of a Notes for Notes’ after-school music studio at a Detroit Boys & Girls Club location. The campaign runs from Wednesday, May 14, 2014 through Thursday, June 5, 2014. For more information, please visit https://www.facebook.com/events/239113936213061. Music for Music’s story sharing contest runs from Wednesday, May 14, 2014 through Wednesday, May 21, 2014. 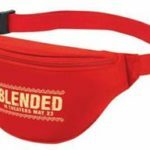 Dance music lovers are asked to share positive and inspiring stories of how music has changed their lives for the opportunity to win a pair of VIP 3-day passes to Movement Festival, a $100 download card to Traxsource, tickets to official Movement after-parties. For each story shared makers of the SubPac portable, silent tactile bass technology being championed by Ritchie Hawtin, will donate $10 toward the effort. The stories will to be judged by a panel of recognized names within the dance music industry, including David Ireland (Wantickets, Magnetic Magazine), Ken Jordan (The Crystal Method), Betty Kang and Lydia Fong (Plexi PR) and FreQ Nasty (SKINT Records UK). 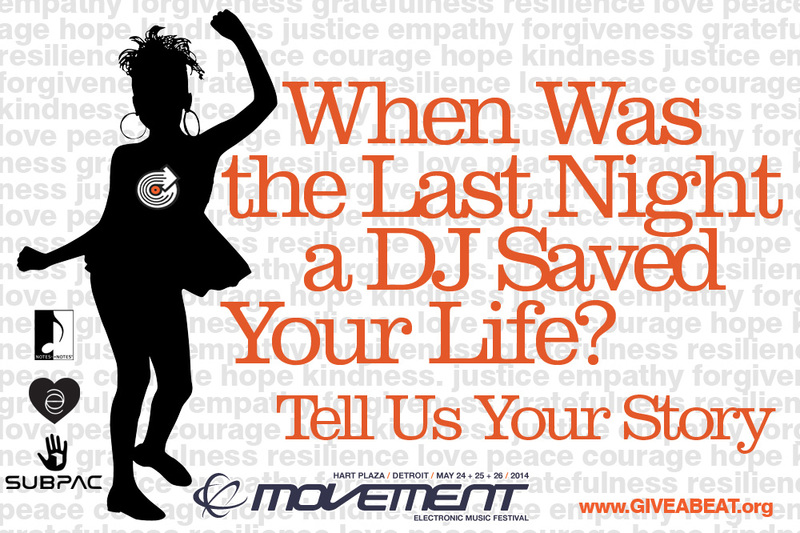 Stories must be submitted to story@giveabeat.org by 9:00pm EST on May 21, 2014 to be considered. The funds raised from Music for Music will go towards the build out of a free music studio at the Diehl Club at the Boys & Girls Club of Southeastern Michigan in Detroit serving youth, ages 6 and up. The studio will be a hub where youth in the community who are passionate about music can come together, regardless of their lives outside of those studio walls, with the resources and tools they need to thrive. The studio will be comprised of three rooms, jam, mix, and record, packed with guitars, drums, keys/synths, DJ and production equipment, digital music workstations, a vocal booth, and more. Notes for Notes is currently working to raise $40,000 needed to match funds already contributed by the Knight Foundation to construct and fully equip the studio. Music for Music is one of the collaborative community efforts being undertaken to help Notes for Notes raise these funds. Notes for Notes was founded on the core belief that music is the universal language of humankind, and has the power to transcend virtually any cultural, racial, or socioeconomic barrier. Notes for Notes is dedicated to providing youth with FREE access to musical instruments, instruction and recording studio environments so that music may become a profoundly positive influence in their lives. Notes for Notes builds, equips and staffs after-school recording studios at Boys and Girls Clubs in Nashville, TN, Santa Barbara, CA and Santa Monica, CA. Music created by youth in these studios can be heard at: soundcloud.com/notesfornotes. Learn more about Notes for Notes and their music studios at: www.notesfornotes.org. Give a Beat serves as a catalyst to transform the positive energy of global dance music culture into meaningful interactions that build community and generate social good. Through active collaborations with music producers, promoters, artists, and socially conscious companies, Give a Beat raises awareness of pressing issues and injustices through live music events and online platforms, while providing dance and world music lovers with a unique channel for activism and philanthropy. Learn more about Give a Beat at www.giveabeat.org. 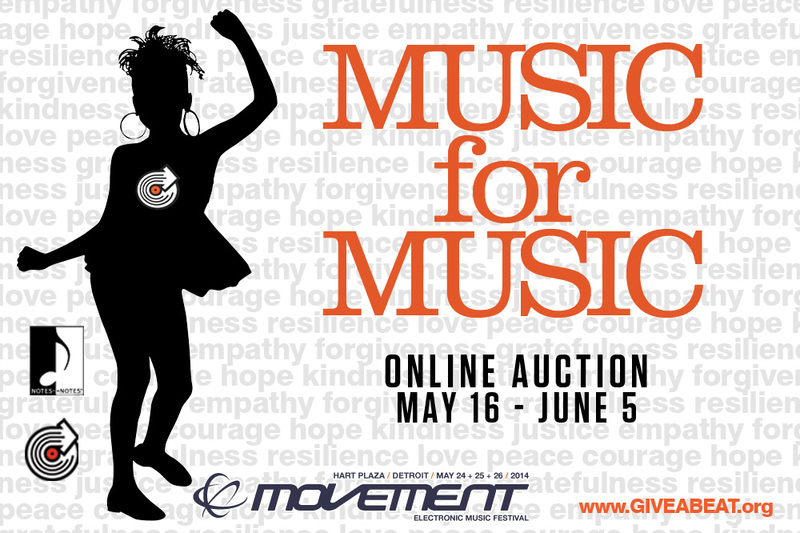 Additional donations are being accepted for the auction now through May 21, 2014.